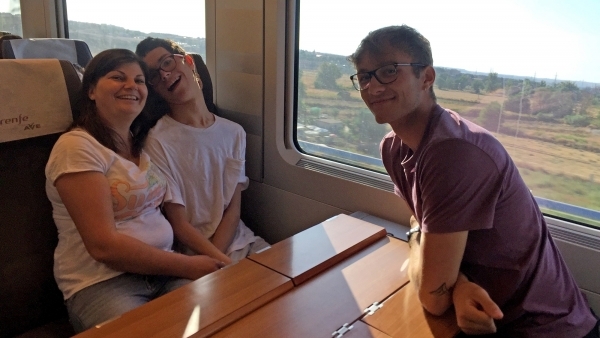 Javier, with 97% disability, has been the first and only highly dependent person to enjoy one of the 15,000 trips in the Discover EU interrail program. El reportaje en español. Javier, el primer gran dependiente que disfruta del Interrail. Javier is 18 years old, and his father, artist Fernando García Monzón, explains "it will be faster if we just stick to what he doesn't like". He loves going to the movies, being with other people, going to bars and restaurants, horseback riding, swimming and skiing, "even though we don't go that often because it's such a great effort". He also likes dancing. 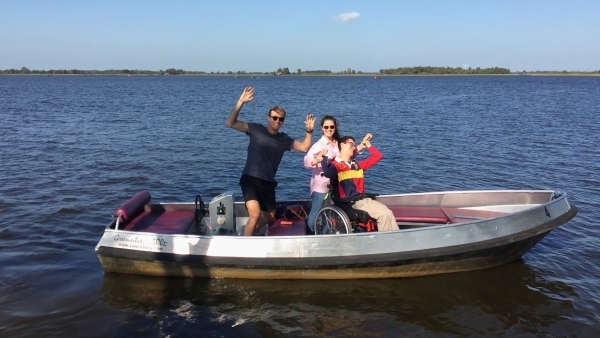 "Two of us have to hold him up as if in a sandwich", says Fernando, emphasizing in this anecdote something he tells often: that in his family there are no limits and that "no one, with or without any disabilities, should have them". Basically, Javier is just another teenager who likes what every teenager likes. Yet, Javier has severe cerebral palsy. "His head is perfect, but he has a 97% disability and he needs help from a third person". Nothing stood in his way to become the first and only highly dependent person to manage to travel via interrail after being awarded one of the 15,000 grants from the Discover EU program of the European Commission. Thanks to his parents, Javier has been able to enjoy this adventure. "I learned that the Commission had launched an inter-rail program for 18 year olds and I told myself, I'm going to write this down because they need to be aware that these people also like to do things, thinking that they were never going to award it to him". Yet, to his surprise, they accepted, and so they initiated a two-month dialogue where the European Commission "delivered", allowing Javier to have three companions in his one-week trip around the Netherlands, since he needs constant attention and adapted room and travel arrangements. Why the Netherlands? "I wasn't thinking of going anywhere back then", says Fernando, " but I said, let's make things easy. The Netherlands is a flat country, and when you're in a wheelchair that is important; and it's also small, which makes it easy to set a base camp and to make one day journeys. Javier and his companions didn't stop for a second. 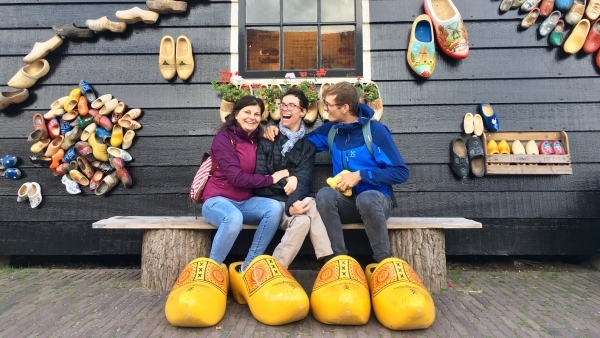 They took the train to Utrecht, Marken, Alkmaar, Giethoorn, etc., living through good and bad experiences. "Javier is a person that's really keen on breaking barriers and traveling. He has enough energy for himself and for everyone else", says Ramon Garcia, who had worked with people with Javier's abilities, but who had "never been 24/7 with them". "Quite often, on the train we had to push the wheelchair to the side and travel with Javier in our arms. Many trains were two stories tall and we had to pick him up and climb down with him", as Ramon explains. "Everything needs to be planned in advance, you need to carry a bit of everything in your backpack, you have to react quickly and always remain attentive. If you and me miss a train, we can run or search for an alternative route, but with Javier, it's not at as easy", Ramon explains. Their biggest challenge was at the city centers: "since they try to respect the historic center, all streets are made of cobblestones and, the sidewalks are very narrow and they are not well kept. There's been a lot of progress, but there's still much to be done. Specially in terms of the awareness of those who own their own businesses", says Ramon. Here's an example of what he means: "In Volendam, a coastal town, it was very hard for us to find a restaurant. 98% of restaurants had the toilets either upstairs or downstairs. Even at some accessible places, the tables were so close together that the wheelchair couldn't get through". How did you communicate with him? "Javier cannot talk, but he understands perfectly, he's as intelligent, or more, as anyone else", remarks Ramon. "He controls everything. If the train is five minutes late, he lets you know right away. He calls your attention and you have to ask the proper questions. For instance: If you want A look up and, if you want B look down". For Ramon, this experience, which he regards as "exhausting and enriching", has opened his eyes. "Now I look at cities, transportation... in a completely different way". He hopes this trip "opens people's eyes, that they learn that this type of people also like to travel, and they have a right to do so". "Javier had the time of his life, but what's most important about his trip is that it enriches society. When you see one person with an empty wheelchair and another person carrying him in his arms climbing the stairs aboard a train, that forces the entire railway wagon to reconsider, even though no one says anything. From the social point of view, it creates references and awakens people to very interesting attitudes", highlights Javier's father, who closes remembering the example set by the European Commission, which response "for me, [their response] was chapeau and, let's hope that it sets the example for other administrations". "Javier was in the best hands", explains his father. Accompanying Javier were his sister Luisa; Anka, the nurse who helps him at home; and Ramon, a volunteer in his fourth year of Nursing school, "because it's good to have a man's help, for instance, when he has to go to the toilet". For people with disabilities, traveling is no easy matter, but Javier's example shows us that it's not impossible. It's not usual for people with disabilities to travel, and we can see that in the Erasmus program. 40,000 young Spaniards participated in 2017, but only 120 had disabilities. Isabel Martínez Lozano, from Fundación ONCE sums up the reasons for us: "they do not receive the proper information and universities do not encourage them to go; they don't know what they're going to find; we also have the protectionism of the environment and don't have adequate support".